Last week I listened to a Stack Overflow podcast in which Joel Spolsky and Jeff Atwood discussed the effects (intended or otherwise) that Craigslist has had on professional journalism. Joel contends that Craig Newmark has, in effect, stolen classified advertising from the newspaper industry and made it something freely available to everyone. Advertising is the method newspapers use to fund professional journalism. But if people can advertise their stuff for free on the internet and reach a wide audience, they have no financial motivation to pay money to a newspaper to publish their ad in print. Instead, people are taking the money they would have spent on advertising and putting it to back into their businesses or their own wallets. Professional journalism is something that keeps citizens informed and keeps governments transparent (or at least tries to). While it sounds like an appealing alternative to professional journalism, citizen journalism simply doesn’t work. Bloggers link to each other, tweeters retweet things they like. But amateurs simply don’t have the financial motivation that a professional has to do original research and report objectively. Citizen journalists simply aren’t doing justice to journalism. Their work is useful and relevant, but it just can’t replace professional journalism. The net effect of Newmark’s decision not to charge for his service is that he’s taking all that advertising revenue out of the pockets of the newspapers and putting it back into the hands of the citizens or businesses, who do with it as they please. That means that a large sum of money is being taken away from an entity that performs a public service essential to a vibrant democracy and freedom of speech. Newmark says he doesn’t know what he’d do with all that money. But Joel suggests that if Newmark doesn’t want the money, he should put it to use for some public good. After all, that’s where the money would have gone in the first place: the public good of investigative, professional journalism. 34-3?!? That was so astonishing I had to search it out. 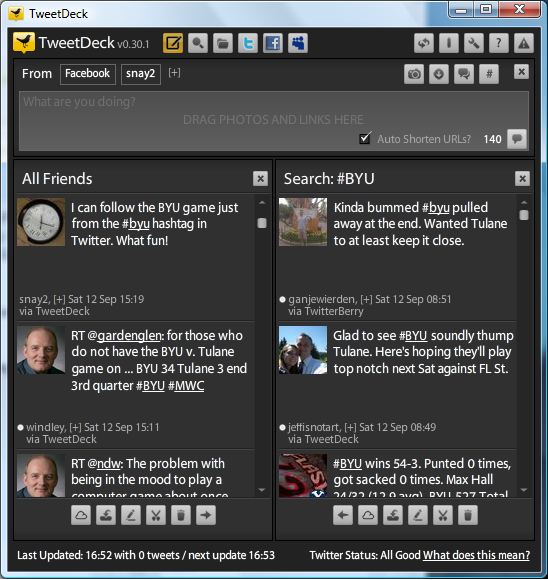 I clicked on the #BYU link, which opened a separate search panel in TweetDeck. This pulled up all the recent tweets containing that hashtag. Most of those had score or play updates. So, what do I do with this new-found tenchnological fascination? Follow the football game by listening to what people say about it. #BYU Rally event page… http://bit.ly/BYURally. Within minutes 1,155 invited. 🙂 Bring it, BYU! A Facebook event was created for the rally at the airport tonight at 9:00 pm to welcome home the triumphant Cougars. And within minutes the word got around to over 1,000 people! Information travels quickly with Twitter and Facebook, eh? Chick-Fil-A Labor Day Giveaway: FAIL! – The humorous story of Dr. K’s adventures with a failed Chic-Fil-A Labor Day giveaway promotion. I started a new blog today and moved my tech-related posts there. That way I can keep my subject matter separate and you can read just the ones you want to read. I believe that everyone has a right to their opinion. I also believe that not every opinion is appropriate for this blog. I take time to carefully reexamine my post content to see if I invited the comment. Even if the comment opposes my beliefs and values, but is related directly to the content, then I’ll leave it. If it makes a good point, I might edit out the nasty parts, leaving the value. It depends, but I think about it and weigh my options, taking into account the intent of the commenter.If it is to inflame, then it’s gone. If it is off topic, it’s gone. If it is spiteful, it’s gone. If it is harmful to others, it’s gone. If it continues the conversation, then it may stay. There’s a lot more good stuff on that post; I’d recommend you read through it. As she says, comments are a crucial part of blogging. Feel free to leave me some, and I’ll work on being a better blog administrator. I’ve been using WordPress for less than a day and like it much better than Blogger already. Better comment features The comment interface is much nicer than Blogger, where you have to go to a separate page to leave comments. It’s so much easier to just have it at the bottom of the post. And the administration side is much easier to use and gives me finer control. Tag cloud I like tag clouds, and they just weren’t easy to do on Blogger. Good analytics WordPress tells me not only how many people came to my blog, but what parts they looked at, where they came from, and where they went. This is a bit better than what I was getting from Google Analytics on Blogger (that service is really nice, too). UPDATE: Just to clarify, I actually think Google Analytics are better overall, but WordPress’s analytics give me what I need to know more concisely. For one thing, WordPress doesn’t provide geolocation information, a feature I like on Google. OpenID Haven’t used it yet, but WordPress gave me an OpenID, which will make it easier to comment on LiveJournal and other sites that use OpenID. Finer control over layout and content Blogger is all single-page oriented, but WordPress allows me to have static pages in addition to my dynamic content. Administration interface WordPress just provides so many features that Blogger doesn’t have. Don’t get me wrong, I like Blogger, and I like Google. Blogger is admittedly easier to setup and use, and probably better if you want a blog that just works. But I’m quite enjoying my new toy: WordPress. So I just ported my old blog from Blogger to WordPress and have been quite satisfied so far. WordPress gives you a whole lot more control over just about everything than Blogger does, and it’s much easier to customize. Given, Blogger was simpler to set up and easier to use, but I like WordPress better overall so far. So, that’s the latest news here. Hello, WordPress!